The sitcom that helped to distinguish TV3 in the 1990s will make a comeback on Three the same week it screens in the US. The next-generation Roseanne will air 7.30 Thursdays from March 29 — a day after its US debut — as the lead-in to Modern Family in its new 8.00 slot. 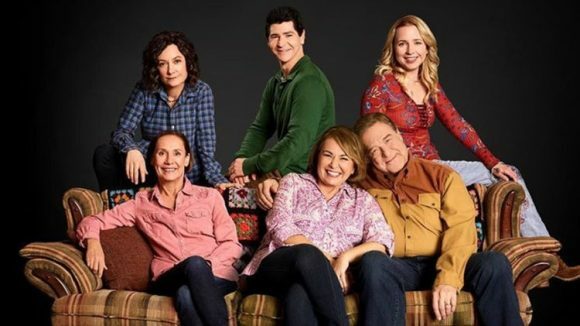 The first season in 22 years reunites the original cast, including Roseanne Barr, John Goodman, Laurie Metcalf and Sara Gilbert. “As with the original, the new Roseanne is most enjoyable when it focuses on the everyday life of the Conners,” Entertainment Weekly says. Much has been made over Barr’s decision to have her alter ego be a Trump supporter, but in the episodes screened for critics, politics serve mainly as fodder for intra­familial ribbing: Jackie passive-aggressively brings a bottle of Russian dressing to dinner; Roseanne counters with “Aunt Jackie thinks every girl should grow up and be president, even if they’re a liar, liar, pantsuit on fire.” Mercifully, Jackie and Roseanne end their election feud in a tearful hug by the end of episode 1. TV Line also thought the new series “pretty fantastic. In fact, the second episode — which largely revolves around Roseanne and Dan coming to terms with gender-fluid grandson Mark’s bold fashion choices — ranks among the show’s best ever. For those who remember its ’90s run, here are “nine things you need to know” about the revival, including daughter Becky now being a widow because Glenn Quinn, who played the character’s husband in the original show, did pass away. If MediaWorks can do spin-offs, TVNZ 2 can look at doing the same but way better, as in series drama and soaps, and get one up on Three.